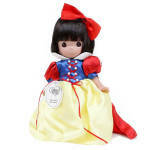 Precious Moments Company 2013 All Vinyl 9 inch Alice in Wonderland doll, No. 3497, represents the beloved Lewis Carroll storybook character that Walt Disney brought to life. 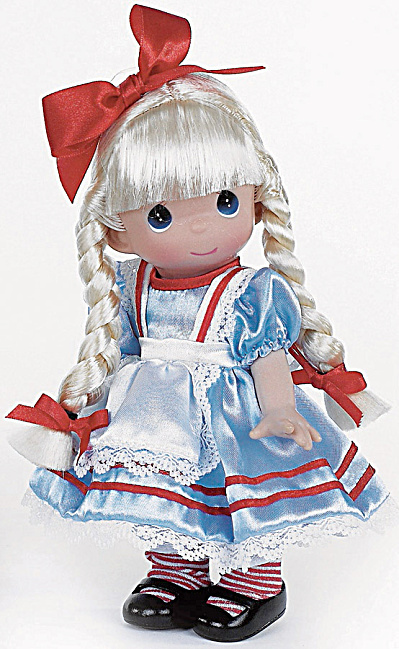 She has pale blonde hair styled in braids tied with red ribbons and a giant red bow on top of her head, blue teardrop-shaped eyes, and a smiling face. She is wearing a light blue satin dress dress with white lace edging and red ribbon trim, a white satin lace edged pinafore with red ribbon trim, white pantaloons, red and white stockings, and black Mary Jane shoes. New and mint with a gift box.